Canada is the world’s second largest country after Russia and has small population; reasons may be many, due to the arctic climate or geographical reasons. But, This North American country is popularly known as the land of immigrants has invited migrant population to settle in its mainland. The migrant population of the world countries is making this area socially colorful and diverse in culture. To run its economy, Canada has to invite immigrant population; immigration has become imperative to Canada. The recent study of the Canada Statistics has revealed the astonishing facts of the Canada population Growth. The Diaspora communities in Metropolitan contribute to 60% of population growth in the Canada Metropolitan Areas. Canada is prospering through the wealth of knowledge of migrants and the outstanding contribution to the different fields of economy. According to the Diaspora, Studies Canada has benefited enormously through the migration. The business skills, willingness to integrate with the host country have made Canada the socially strong country for people around to settle in Canada. Canada Immigration and its provinces have framed over 60 immigration programs to facilitate the migrants to Settle in Canada Permanently. British Columbia, Alberta, Saskatchewan, Manitoba the Western Canada provinces have shown increased immigrant population. In contrast, the Eastern most Canada Provinces and Central Canada immigration population are decreased. 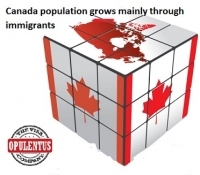 Canadian Metro Politian population is growing rapidly by over 15 percent annually. Vancouver, Toronto, Montreal, Ottawa, Calgary, and Edmonton MPAs experienced population growth above the national average set by the Canada Government 11 %.